I’m often asked when the right time to pick an apple is, a fruit may look ripe for weeks before its optimally ready to harvest. It varies from variety to variety, different years may change the pick day, and what the fruit is intended for has some bearing on when to harvest (i.e. for immediate consumption or long term storage). 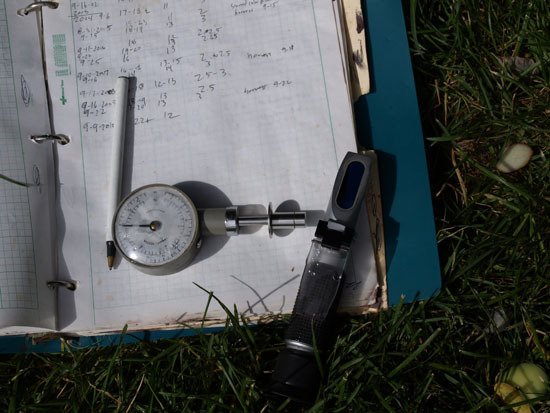 I use a few tools; a pressure tester (or Penetrometer) , a refractometer and a solution of iodine. 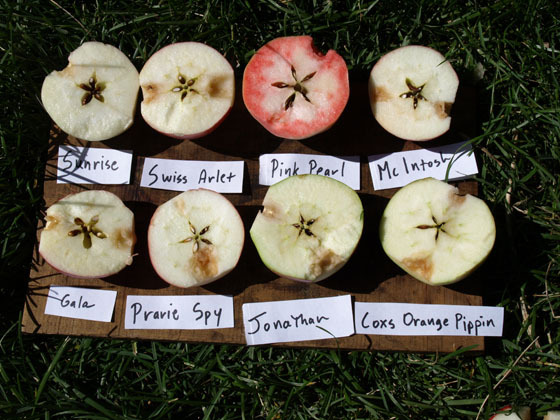 The first two are quite useful but not necessary for checking backyard fruit. 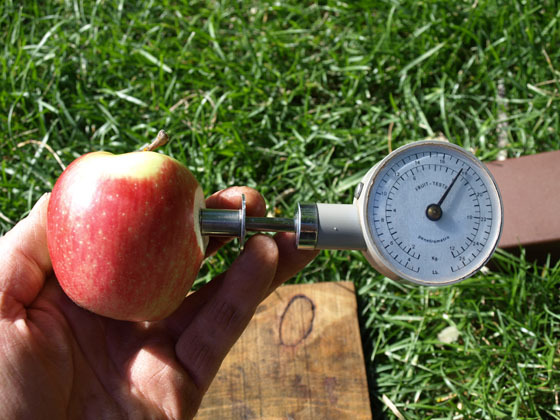 The pressure tester is used to check the density of the fruit ( Also the main way to check Pears for ripeness) the probe end is inserted into the fruit (a flat spot cut) to the indented line on the probe end and the dial indicates how much pressure to get to that point . Then I check the soluble solids, brix level or basically the sugar of the fruit with the refractometer. I keep track of all the info leading up to optimum harvest from year to year, so I know about when a particular variety will be ripening. Like I said before, this is all neat o tools which if you can afford, like this kind of thing and have fruit to test, get it. 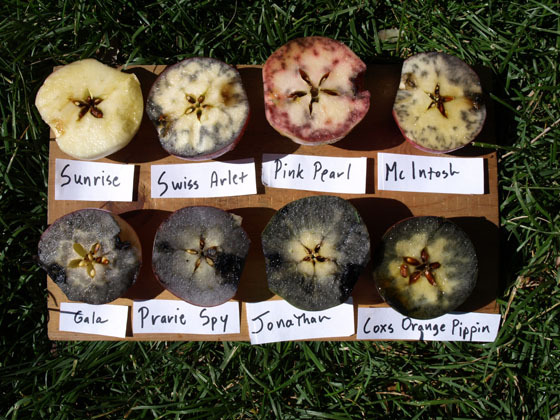 But my favorite and really telling way of checking apple maturity is the starch /iodine test. And very economical too. The above (and below) photo was taken September 14th, the apples are cut cross across the core, exposing the seed cavity. A iodine solution was sprayed on (below photo) and what is revealed is the sugar to starch ratio of the fruit. The iodine stains the starch in the fruit black but not the sugar. Starting at the upper left, going across then back to the lower row. I started with the Sunrise apple which I knew to be too ripe (was left on the tree after I harvested them a couple of weeks ago) shows all sugar. At that point its too ripe and soft, good for apple sauce. The next three show a good mix of starch to sugar, the Arlet apple is optimum (I’ve already started picking them) the Pink Pearl and McIntosh will come off soon. The lower row shows mostly a starch pattern except the Coxs Orange Pippin in which I’ll do some further testing, but is at the point in the photo which would be good for long term storage. The others on the bottom row I’ll keep track of and test in coming weeks, all still too green . A apple too ripe, as the Sunrise is bland and soft, the next few have a good blend of starches and sugar but won’t keep for long (a few weeks in a fridge). For long term storage the fruit needs to be somewhat along in ripening but not too far, the vascular bundle (the area around the seed cavity) needs to be sugar. Thats part of the trick to getting the fruit ripe enough but not too ripe, if picked to green or starch it won’t ripen no matter how long its stored. Another indicator of when to start testing is the seeds, they need to be turning or be brown. And generally early apples won’t keep as long as later apples will. If you only have a few apples and aren’t concerned with storage, taste it! This entry was posted on September 15, 2010 at 9:22 am and is filed under farmers market, Grouse Mt. Farm, organic fruit with tags apples, fruit ripeness, starch/iodine test. You can follow any responses to this entry through the RSS 2.0 feed. You can leave a response, or trackback from your own site. I am the picture editor for the Royal Society of Chemistry, which publishes the membership magazine Chemistry World. In our next issue we are publishing an article written by one of our freelance science writers, Andy Extance, on the chemistry of cider production. I am looking for a photograph of the apple iodine test for sweetness, and I found two great examples on this website. I was wondering if you would grant permission for us to use them in our article. I have a short deadline for this article, so if you could you get back to me by Mon 10th November I would really appreciate it. I look forward to hearing form you soon.